Bait presentation — more baits in the water covering a larger area. Proudly display your fishing flags. Precision Marine Hardware has developed advanced outrigger systems, Premium and Econoline, both suited for a variety of applications and conditions. Our outriggers feature fiberglass sticks with stainless steel hardware. 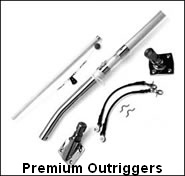 Both outrigger packages include all mounting hardware, starboard wedges, shock cords and full rigging. Precision Marine Hardware is the home of The Maximizer which broadens your outrigger coverage. The Maximizer extends the position of your outriggers from their original 45° position by adding 60°, 75° and 90° positions. A 15' outrigger at 45 degrees extends 10’, 3” outside the width of your boat. With the Maximizer, a 15' outrigger positioned at 90° extends 15 feet. A gain of almost 5 feet on each side.